In Irvine, where Koreans constitute only 5.3% of the city's population, there are six Korean soft tofu restaurants. 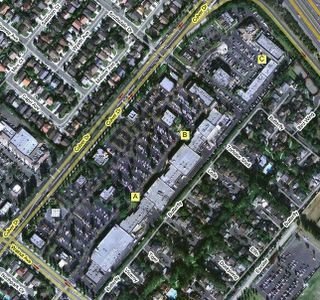 Serendipitiously, three of the six are clustered together like mushrooms in the same sprawling neighborhood shopping center. Figuring out how and why this happened might be a good subject for a graduate thesis on free market economics. But whatever the reason, one thing is clear -- you can't just tell a friend to meet up at the Korean restaurant at the corner of Culver and Walnut. Unless, that is, you intend to play a hilarious prank. Whether planning mischief or making legitimate dinner plans, for your convenience I've diagrammed the locations of the three restaurants in the satellite photo above. 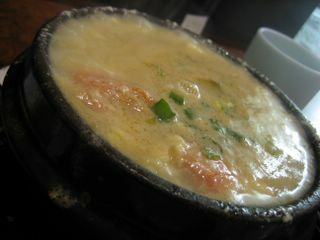 Although each restaurant is unique in look and atmosphere, all feature the beloved sundubu jjigae -- a bubbling hot cauldron of soft tofu soup served table side. 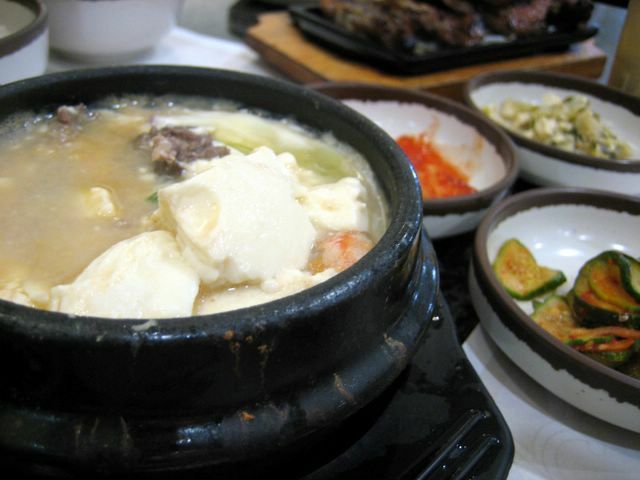 This dish is comfort food to Koreans, but enjoyed by all hungry people alike. It is especially satisfying during this time of the year when the air is bone-chilling and heavy rain dampens the spirit. 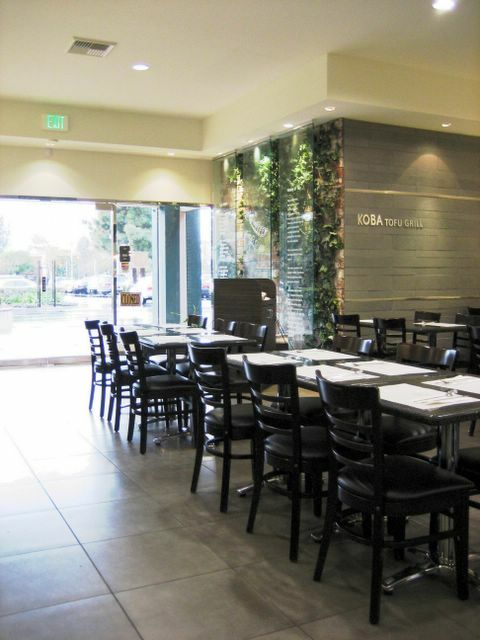 The newest of the trio of restaurants is Koba Tofu Grill, which until recently was the Irvine outpost of the popular soft tofu chain BCD Tofu House. As BCD, it gained instant popularity when it opened for business not more than a few months ago. It was the new bride in white and stole all the attention away from the other maidens, if not only on the merits of the BCD name. But the honeymoon between the owners of the Irvine restaurant and the parent company was short-lived, and the divorce was final even before I got a chance to try the restaurant under its BCD moniker. By the time I finally stepped through its glass and chrome doorway last Friday, the restaurant had severed all ties with BCD and rechristened itself Koba Tofu Grill. All traces of its former life as a BCD concubine was erased form the menus, the marquee, and the placemats -- not unlike it went through a brain wipe a la Eternal Sunshine of the Spotless Mind. Unchanged was the restaurant's modern interior. Utilizing stark white, grey granite, and brushed metal motifs, the end result was an environment as cold and sterile as a hospital operating room. The utensils provided on each table push this theme to an uncomfortable extreme. The chopsticks were made of polished stainless steel rods, making them so awkward, slippery, and dangerous to handle that even the most dexterous will abandon them for a spoon, for fear of chipping a tooth or poking out an eye. And although I cannot compare its food to what was served during its halcyon days as BCD, the dishes I consumed Koba Tofu Grill remains by-the-book and traditional. Sundubu jjigae is the featured entree of choice -- a boiling soup of custard-soft tofu, diced beef, unshelled shrimp, and a clam served in small cast-iron cauldron. For the two of us, we ordered one Combination ($14), which included the soup, rice cooked in a stone-pot, several small side dishes, and our choice of a second entree. We picked the ubiquitous Korean BBQ short ribs, called kalbi and asked for an extra order of stone-pot rice for $2, so that we could each have our own. Upon bringing the stone-pots of rice, our kind server scooped out its contents into a second bowl. Almost immediately afterward, he poured a pitcher of liquid into the pot, submerging what remained of the crisped, stuck-on rice under hot water. For those unfamiliar with this practice: he was making rice soup. Although favored by some, I've always thought the product of this impromptu demonstration looked and tasted like dirty dish water. I much prefer scraping off the crunchy rice with a spoon at the end of the meal, eating it up like crackers. Next to arrive was an array of small side items called banchan, served in small saucers. 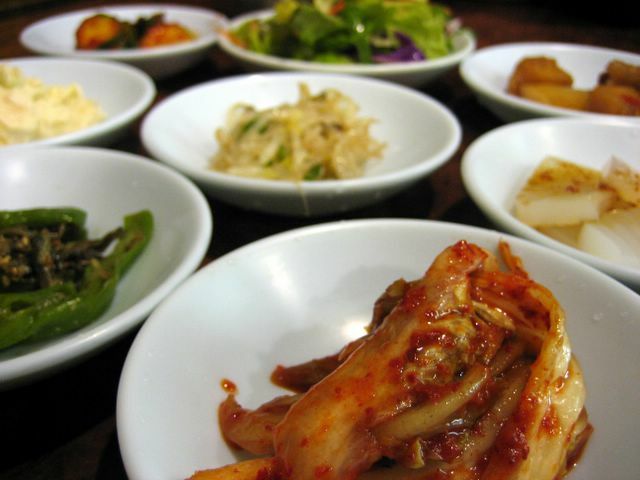 Kimchi, napa cabbage pickled in a fiery red Korean chili paste, is a staple for any Korean meal and it was good here. Along with being tart and crisp, it harnessed a slow but hot pepper burn. Another favorite was the whole yellow croaker, a small fish the length of two pinky fingers, deep fried golden with a crunchy batter. I relished picking up each morsel of its moist flesh and saved the salty skin for last. The rest of the banchan consisted of different marinated vegetables and a tuft of black seaweed, none of which were very memorable, unfortunately. The soft tofu soup was standard issue. Good but not great. 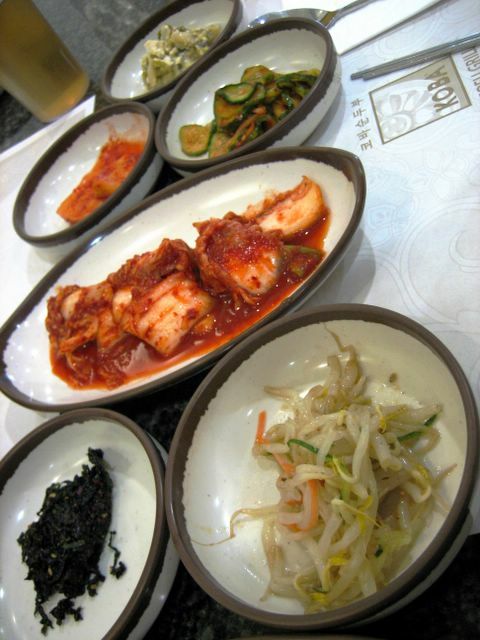 Although we always order it "white", meaning "hold the gochujang", the broth lacked soulfullness and body. The soft tofu curds, however, readily melted into a mouth-filling blanket of warmth, making for a wholly satisfying sensation. 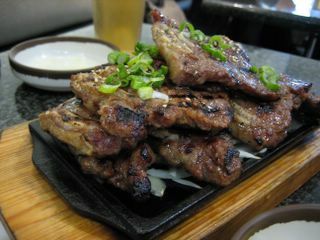 A point of minor disappointment was the kalbi. Being cut too thickly, it was far too chewy to be pleasant. What I did manage to masticate and swallow lacked flavor. A longer soak in the marinade might have allowed it to pick up more of the requisite sweetness of sugar, the nuttiness of sesame oil, and the saltiness of soy. The oldest and most no-nonsense of the bunch is Korean Dae Myong OK Restaurant. 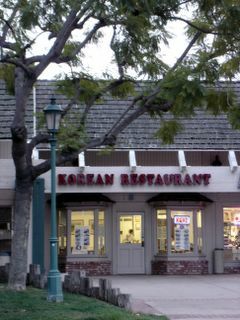 Residing in the middle of Heritage Square, its marquee is unceremoniously stenciled with the simple phrase "Korean Restaurant". Inside, the tabletops are worn from thousands of elbows, and the walls are barren, save for a few stock posters of the old country. This is a dive which ignores trends and sticks to what works -- good food, cooked by people who've done it forever. And although I haven't revisited this establishment in a few years, I am sure that nothing's changed. Rice will be served in metal bowls, and the generous variety of banchan offered will cover the table like a quilt -- a dizzying patchwork of colors and textures. Kaya Tofu House is tucked away in the northernmost corner of the plaza and is my current favorite out of the triumvirate. Inside the cozy restaurant, dark hued woods added warmth and wallpaper made of aged parchment was scribbled with cascading patterns of Korean script, suggesting a reverence for tradition. Coupled with this, a call button was glued on the wall next to each table. When we pushed it, our table number lit up on a LED display above the kitchen doorway while an audible 'ping' reverbed through the tiny restaurant. Even more beguiling than the elaborate paging system is the fact that most of the waitresses seem to ignore it, responding more readily to a raised hand or just a slight nod. As for the food, it's great in every way. We ordered the sundubu jjigae combo which was also priced at $14 and included all the side dishes, and one stone-pot rice. An extra order of rice was also $2 here. The soup contained all the components of those served at Koba and Dae Myoung, but was richer and deeper in character. It's the sort of soup that soothed as much as it satisfied, like coming home to a place that's familiar and warm. The banchan served by Kaya was one of the most varied and innovative I've had in Irvine. Stewed potatoes crumbled softly after a long simmer in a soy and mirin broth. Dried anchovies were fried to a crisp and paired with sweet green pepper pods. Chilled potato salad was dressed in cooling mayonnaise. Even the green salad and pickled cucumbers had a brightness of flavor that surprised and refreshed my palate. 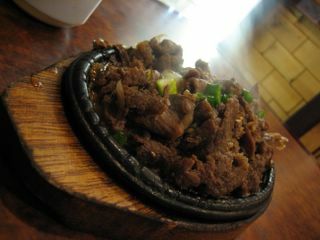 The bulgogi, tender ribbons of cooked beef served on a sizzling hot plate with softened onions, was pitch perfect, without being too sweet or cloying. Dusted with sesame seeds and sprinkled with chopped scallions, this was a dish that begged for hot steamed rice. All differences aside, each of these restaurants offers a complete and hearty Korean meal that nourishes the body as much as it delights the tongue, and for no more than $10 per person on average. i'm an a-hole, i would totally do that to my friends. and when they call you tell them "no, you dork, the other korean tofu place!" punk your friends man, its the american way! Very thorough. I still cant understand why most korean restaurants prefer the metal chopsticks. They are hard to use and you feel like you're at the dentist with all that metal in your mouth. Very unappetizing. Interesting how there is another duo of tofu spots just down the street on Jeffrey/Walnut. That makes it 5 resto's in a 2 mile radius. Almost feels like garden grove, huh? Hey Elmo - Isn't it funny how the same type of restaurants will congregate together? I've often wonder how these Tofu Houses survive during the summer - I have problems eating Tofu Jigae during hot weather. Would you believe that we punked one of our friends without even trying? Even funnier is that he didn't have a cell phone with him at the time...so he just plain gave up and went home. Yeah, I still don't get why the metal chopsticks. I didn't know that Koba wasn't the only one who uses 'em. I despise them. You're right about feeling like your getting a dental checkup. So with the two near Walnut and Jeffrey, that area is definitely becoming a mini Koreatown (and without any Korean grocers around)...the sixth Korean place, by the way, is on Irvine Blvd and Yale. I think my economics professor would call this network effect. Although I just call it interesting. I guess one success breeds others. But yeah, I bet they're dead empty during the summer. Sundubu is for winter consumption only. I didn't know the no-nonsense "Korean Restaurant" existed at that shopping center! I might have to try it some day with my family. 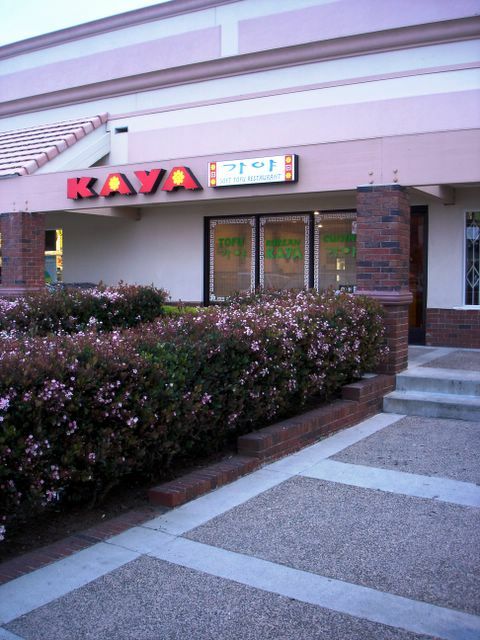 I have eaten at Kaya many times and have always been pleased with both the service and food. I've only eaten at Koba once, on a whim, and the food and side dishes seemed perfectly fine to me except for the kimchi; then again, Korean food is sort of a 'new' thing for me these days. I really like the interior of Koba and that was the main reason why I dined there. As for the metal chopsticks...you know what? I don't get it. It might just be a Korean thing - I remember my ex-roomie and all my housemates in the dorm that are Korean ate with thin metal chopsticks. Innnnn-tense post Elmo! Dang, you are the Mapquest, Yahoo! Maps, and Google Maps of the food blogging world! I love those hot bubbling pots full of liquid magma and tofu. Do you like the spicy versions? I actually stopped by an SF Tofu House the other day. I ordered "extra spicy," and the Koreans at my table looked at me with extreme skepticism in their eyes. Well, as the waiter finished taking my order and started to leave the table, one of the Korean guys at the table "audibly" whispered in the waiter's ear to give me mild instead. Huh. I say, "Bring it (the spicy tofu) on!" So Koba *wasn't* just being cutting-edge by putting out those metal chopsticks...interesting that it's taken me this long to encounter the metal chopsticks. I guess this means I just don't know many Koreans. That's hilarious that a stranger actually told the waitress to bring you a milder one instead. I'd be offended except that it actually sounded like he was concerned for your safety! I like hot stuff, but when it comes to a boiling soup that's going to scald me already, I opt for mild or no spice...my body just can't take the abuse! Another triumph in food blogging, and with a map to boot. I have only had Korean food one time in my life and that was a horrible experience in Vegas that left me cold to the food for a while. I guess I should change that. J. will be thrilled with your review and will probably be sampling them all soon. As always, thank you for your kind comments! I am sorry that I disagree with your description about Koba's intereior decoration. I feel it is very stylish and warm. I also like the way they use the traditional Korean chopsticks to server customer. I think you might put too much personal bias in the food blog...though I've always enjoyed to read them. I'm guilty as charged. I definitely put a lot of personal bias into my reviews. I guess that's the nature of writing -- you have to start with what you know and work outward from there. But with more knowledgeable people like yourself, and others who've commented above, I've now learned that the metal chopsticks are traditional Korean utensils and not something that Koba (or BCD) thought up as part of a design choice for their restaurant. One of the things I hope to gain when I write these little reviews is more education and enlightenment over things that I only have surface-level knowledge about. So thanks for reading and making comments! How do you get google maps to have multiple thumbtacks in the image? also, I thought it would be interesting to point out that I got either food poisoning or the stomach flu one day after eating at Koba (If that's the one by Ralphs). Coincidence? I have no idea. I hope not, because I liked their food, but I did spend some time at the ER. Hey thanks for visiting! So sorry to have heard about your Koba experience...anything that ends with a trip to the ER is never good news. But to answer your question, I added the extra labels on top of the Google Maps myself. Just thought it was easier to do than figure out how to get Google to do it. We'll probably try Kaya first. Is there anything else there that you'd recommend ordering, other than what you described in your post? Thanks! I think what I described (the Soft Tofu Combo) will do nicely for two people, especially for a first visit. To be honest, I don't venture too far away from this, although one time I did order bibimbap, which is basically a large bowl of rice decorated on top with different types of veggies and cooked meats. Then, you drizzle Korean chili paste all over it and mix it up like a salad. Pretty good stuff, but it takes a little getting used to. Chapchae is also a treat. It's a simple dish of stir fried glass noodles with vegetables and meat. The pleasure is in the jelly-like texture of the noodles. Enjoy Kaya! Hope you have fun time! Okay, I really have lost my mind -- or at least my memories of my youth -- I totally forgot that I used to go to a hole-in-the-wall Korean joint in Ann Arbor called Steve's Lunch and order bibambap about once a week or so. Loved it, with or without the egg. There were only about four other dishes offered there, but I don't remember if I ever tried any of them... Okay, so I'll put that and chapchae on my list -- thanks! Yes, it is a uniquely Korean "thang." I'm Korean, and yes I even agree it's somewhat cumbersome, but it's just tradition I guess. Also, I read somewhere that all those millions of disposable wooden chopsticks used in chinese/japanese joints destroys thousands of acres of rainforests each year, so the metal sticks are actually very environmentally friendly. Kinda cool, eh? I'm Korean myself, born in Korea, raised in the US. A bit of insight on "metal" utencils: Back in the ages of Kings and Kingdoms in Korea, the Kings, high ranking officials had Gold or Silver (sometimes a mixture of both) utencils. Primary reason for this is that the metal changes color drastically under poisons. Since then, gold/silver utencils were a symbol of goodwill well being, usually parents giving a set of 6 or more to a daughter getting married. I grew up using the metal chopsticks and find the wooden ones rather clumsy. Good write up you have of Tofu Hot Pot. Personally, I will not ever go back to a BCD Tofu chain ever again. Their food is mediocre and below my par of tofu places. It's in the lot w/ the Bank of America. The Restaurant is diagonally SE of a doughnut shop. you can get Not Spicy (white), mild (slightly orange), Medium (orangish), Hot (Red). I personally get the Medium w/ beef. How funny that you mention Ann Arbor, as I am *IN* Ann Arbor as I type this, for a business meeting. I'm just sorry that I don't have any extra time to try out Steve's Lunch...sounds like my kind of place. Thanks for the fascinating information about the metal chopsticks. I didn't realize how much of an interesting history was behind it! Detecting poison! Now that's reason enough for me to try to use them. Oh, Elmo, I'm so jealous that you are (were) in Ann Arbor and I'm not! I enjoyed living there so much, and it's hard to find excuses to get back there. They may not have nearly as many restaurants as we have here (obviously) but for most of the ten years or so I lived there, I lived within walking distance of downtown. So we'd just all wander down to eat full-spread Ethiopian at Blue Nile or great creative vegetarian at Seva, or stroll down Main St to see who was sitting at which outdoor tables and pull up extra chairs, then go to the Blind Pig for rock and dancing, or Bird of Paradise for jazz, or maybe catch a movie at the beautifully restored gilded Michigan Theater. Then stagger home happily fed and tipsy. Or just stay up all night and pour ourselves into the Fleetwood Diner (all eight seats, I think?) for breakfast with the sun. Ah, those were the days. Oo, and those delicious burgers at Blimpie's, how could I forget... It's amazing how many places that were already local landmarks when I first moved there in the 80s are still in business. Well, next time you go back, try some of those places for me so I can enjoy them vicariously! Before this week, I had no idea Ann Arbor was such a nice place. I've been to Pontiac, Michigan once and thought Ann Arbor would be more of the same...chain restaurants, truckstops. I was dead wrong. On my last night there, a whole group of us from the office met in downtown to eat dinner at Grizzly Peak. I had the salmon, which was alright, but others couldn't stop talking about the filet mignon and the shrimp. Best of all was the atmosphere. Raucous without being annoying, casual but still dignified. It's still a brewhouse, but one of the best I've seen. Downtown was also really quaint, reminding me of Uptown Pasadena, but with more charm. I wouldn't mind if they send me back up there soon, so that I can try your other recs! I'm korean and I grew up using metal chopsticks. in fact, i have silver ones emblazoned with my name character back at my mom's house. I find the metal chopsticks more sanitary than wooden or lacquered chopsticks. Especially coming out of the dishwasher, I hate how wooden ones absorb (i'm not talking about disposables) water. In in terms of gripping power, I don't really find much difference with either or. Actually, disposoble wooden chopsticks tend to hurt my hand as the top part is square. However, I do have to agree that for noodle type dishes, wooden ones are helluva lot better to manage. 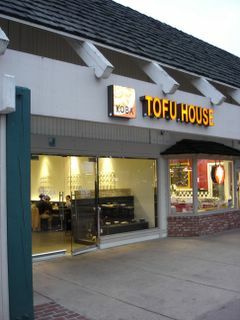 Another tofu restaurant opened up on Yale and Irvine Center Drive (next to vons). Is that the six Elmo was talking about or is there more? Gotta have em all. Yup, I counted Cho Dang on Irvine Blvd. and Yale (next to Vons) as one of the six. Interesting way of describing Soft Tofu (Soon-Doo-Boo) places. I enjoyed it. In Korean community, KAYA and DAEMYUNGOK isn't considered a "Tofu specialty" restaurant. KAJU Tofu & IRVINE Tofu is considered "Tofu Specialty" restaurant. I believe there was new on just opened up on Irvine Blvd but never tried. So far I like the KOBA the best since Tofu should not be all broken apart. Most of the Tofu should be bigger than your spoon. All the other places use broken Tofu. From my experience first choice would be KOBA and second is KAJU. My taste bud may be different from you since I order it spicy. Sorry I'm late in replying. Cho Dang on Irvine Blvd. was the one I was going to try next, but now it's July and it's too hot to even think about soup, let alone a hot, spicy soup that comes in a boiling pot! Hope it gets cool soon, because I'm starting to miss sundubu! I went to Ka Ju Tofu last night w. my BF and two cousins. It was a bit of an odd experience, we put our name on a white board, and waited outside... then the waitress said "you a-order nowww" and handed us a laminated menu. We ordered, and ten minutes later she brought us inside to be seated, another five minutes and the food came out. It was worth the wait. Service was a bit slow, but they were responsive once we got their attention with the nifty table side buzzer. Thanks for dropping by my blog! Ka Ju remains untried by me. But won't be for long, now that the weather is getting cold again. I'm glad you're enjoying my food adventures. I've got more coming! I am finding your blog immensely culinarily helpful! I had been to BCD Tofu, and I liked it, but after reading this post, I decided to try Kaya. You're right, the banchan was excellent and varied. I ordered bibimbap in the stone bowl (which is probably my favorite Korean dish). It was very good, but it had ground beef! That seemed really strange to me (instead of thin pieces of beef). What do you think? Anyone else know if this is also traditional? I really didn't like the ground beef (it just tasted too much like hamburger), but the rest of the dish was very tasty. When I ate the crunchy rice at end, it had a very nice flavor, too. Thanks for the tip, I'll definitely go back! Glad you liked Kaya. I need to go back soon, now that the weather is cool. As for the bibimbap, I'm not quite sure if ground beef is traditional. Although I'd question it too. Hopefully if someone who knows reads this, they will grace us with their knowledge. I tried Koba Tofu Grill today and i totally was amazed with the chopsticks. I remember reading your blog and I forced my dad to pull over! When the food arrived it was like HOT! Like....TEMPERATUREEEE HOT! But what can i expect. It was a nice experience. The service was alright.